Everyone knows that you don’t judge a book by its cover. You pick it up, flip it over, and judge it by the blurb instead. Sometimes snappy, other times breathless, and usually including some zealous combo of the words ‘haunting’, ‘thrilling’ and ‘un-put-downable’, a blurb is a publisher’s one-chance sales pitch to snare the attention of a browsing book buyer. But this promotional tool wasn’t always wielded by publishers. The first blurb ever is thought to be found on the spine of the second edition of Walt Whitman’s Leaves of Grass, one of the American writer's most famous poetry collections that was published in 1956. As the second edition of Leaves of Grass headed to press, an enterprising publisher took the quote and printed it – in gold leaf, no less – on the spine of the book. Voila. The blurb was born – but not yet baptised with a name. 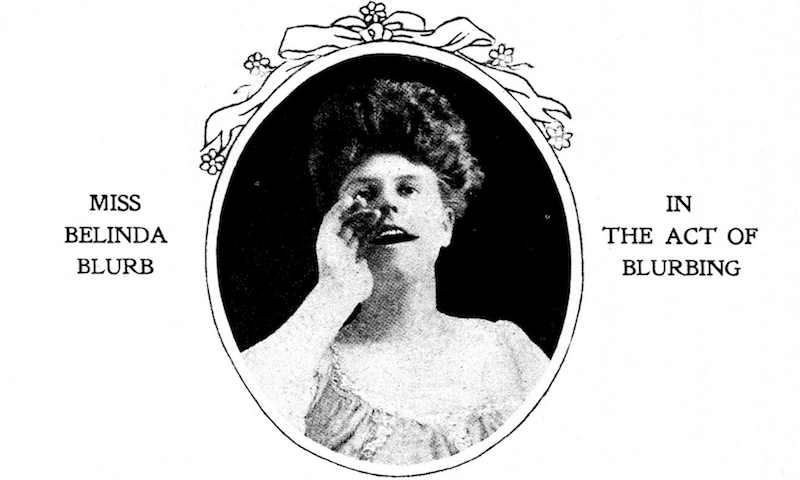 That honour fell to American humourist Gelett Burgess in 1907. To promote his book Are You a Bromide?, Burgess printed 500 copies and handed them out at the American Booksellers Association Banquet. At this point in time it was standard to have a few promotional quotes printed on the dust jacket of a new book. According to Burgess's publisher, the quotes were usually accompanied by an image of a ‘languishing, heroic, or coquettish’ damsel. They called the admiring damsel Miss Belinda Blurb. Publishers and booksellers loved it, and the term for promotional text on the jacket of a book became irrevocably known as a ‘blurb’. Gelett himself defined the word as 'a flamboyant advertisement', or, more to the point, 'to sound like a publisher'. So next time a well-written paragraph on the back of a book or a particularly persuasive celebrity quote sends you straight to the counter of the book store, say a little thanks to Gelett Burgess and his fictional purveyor of plaudits, Miss Belinda Blurb.